Some of the former Australian players have raised question marks over Mitchell Starc's form, match fitness and body language. The left-arm paceman finished with the figures of 3 for 40 but looked far from best, bowling a couple of wayward deliveries down the leg side that cost Australia eight runs during the crucial juncture of the first Test against India. "At the moment he just doesn't seem to have that rhythm. If you've got a good rhythm in your run-up, good intent running in and building up pace … a strong front arm and getting through the crease (you're likely to be bowling well). I just think it's got to do with his run-up firstly, and then when he gets to the crease he doesn't have his normal rhythm. He's probably leaning back a little and overstriding, and then you don't get through the crease as well," Glenn McGrath said on Channel Seven while doing the commentary on Day 4. "We saw two balls where (he) dragged it down the leg side (and) went for four byes. You know when you (don't have) rhythm, it's coming out poorly. He's not using his run-up, he's trying to do it all at the crease. And you've got to feel for him – when the confidence is down, you've just got to relax and trust in yourself that you haven't forgotten how to bowl overnight. Just run in, relax and just bowl," he said. "Watching him bowl in the first innings, I was happy with the way he was going "He was swinging the new ball, he was bowling good areas. But whether he hasn't had enough bowling under his belt – they bowled 19-20 overs in that first innings, he's bowled quite a few in this second innings – whether he has the bowling fitness to get through the matches (I'm not sure). That's why I always worry about resting players … you do need the bowling under the belt. Match fitness – you can't get it in the nets, you can't get it running, you can only get it out there in the middle," McGrath added. Meanwhile, former left-arm quick Mitchell Johnson, who played 13 Tests alongside Starc, said he wasn't much impressed with the 28-year-old's body language. "I just don't like his body language. He hasn't given a bit of a glare or puffed his chest out with a good follow through, let the batsman know he's in the contest, that he's going to rip the pegs out," Johnson said on ABC Grandstand today. Starc has so far picked up 24 wickets at 33.79, which according to Shane Warne isn't good enough. "He's the leader of the attack, your main strike weapon, he cleans up the tail really well, but to take 19 wickets at 36.1 in six matches, he probably needs to be better than that. It's not good enough if it's not working, and you're having too much time off, you've got to find a way to play more cricket to find your rhythm," Warne said on Fox Cricket. 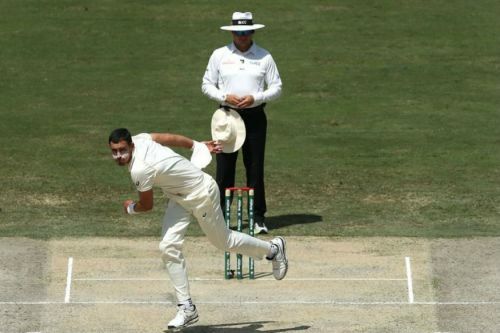 While David Saker said Starc has been able to find a good rhythm and some good pace, Allan Border had a contrary view to the Australian bowling coach. "I disagree (with Saker), it just looks like he's off his absolute best, particularly when bowling over the wicket. He just doesn't seem to have the same rhythm. There's something not quite right there. When he goes around the wicket he's got better rhythm and his lines are better," Border said on ABC Grandstand.